A pivot report can answer this question in a snap. But the answer is incomplete! Performance eh?!? How to measure it? One person’s sale with rest of team etc. One of the most common ways to measure performance in situations like this is to see how this months value has changed compared to previous month. How to show monthly values & % changes in pivot? That is right. 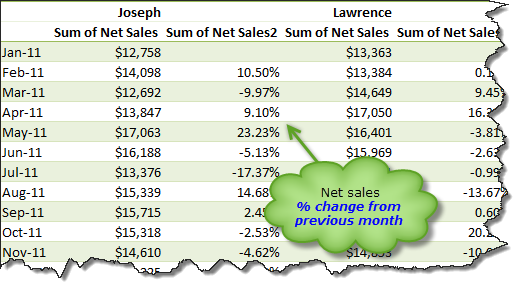 You can add same metric more than once to pivot table value field area. 4. Right click on 2nd value and choose value field settings. This will show % changes with respect to previous month in the pivot report! Change the titles to Sales & % change. To do this, just select the first column title and type over. Repeat for 2nd column. Specify the rule as mentioned in below illustration. We can go one more step and show just icons. Since pivot tables show tool tips on hover, we can easily find % change for any month / sales person by just pointing on that cell. Click here to download this example pivot report. 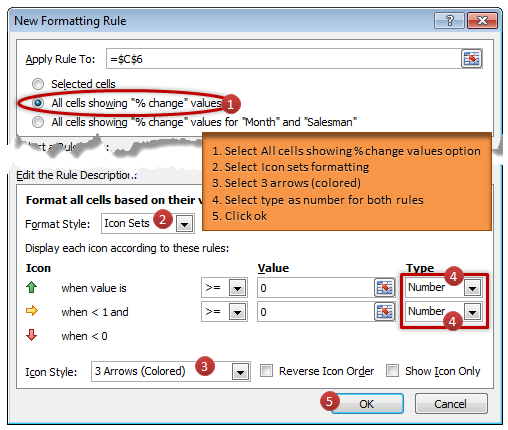 Examine various settings & conditional formats to learn this better. How do you use value field calculations in Pivot reports? Although most of my pivots use simple sum or count type of summaries, often I use custom calculations like % difference from, running total , % of row etc. to understand the data better. These are very simple to setup yet give powerful insights. What about you? 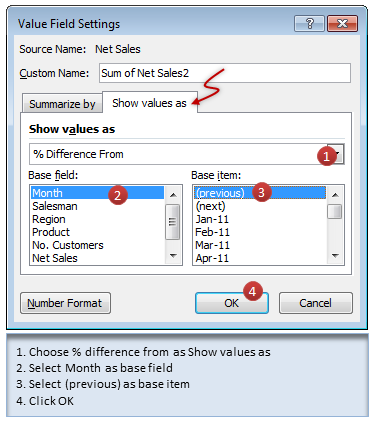 Do you use value field settings to modify your pivot reports? What other summary techniques you use? Please share your tips, ideas using comments. Along with formulas, Pivot tables are best friends of Excel analysts. They can take massive amounts of data, process and summarize in just a few clicks. To learn more about them, use below resources. All these days I was using show value as '% row total' or '% column total' or '% grand total' only. Now after seeing this tutorial I will start using others also..Thanks a lot for explaining this. Awesome stuff. 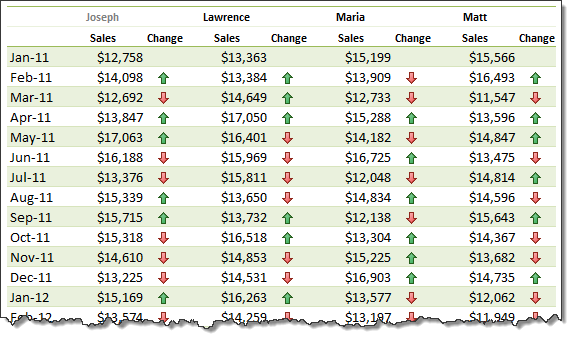 Really can do a lot of nice things in pivot tables, though they do have some limitations. Depending on your data, using the free PowerPivot add-in might be a good fit. Can really do a lot more, but not always needed. Also, maybe a future post about the GETPIVOTDATA() function. Just an idea, good stuff as usual! Is there a way to duplicate this (the symbols bit) in excel 2003? Then apply conditional formatting as necessary. excellent, thanks dude (why my company don't upgrade, at least to 2007, I'll never understand). Excellent feature. I used your previous examples to achieve this is a regular spreadsheet. Doing it in a pivot table is fantastic and never occurred to me. I have just incorporated the method into all end-of-month reports for tomorrow. When I apply %of Columns in Pivot Table and Filter the Data by selecting some specific months It changes the percentages everytime because it assumes it as 100% and divide the rest months percentage by it BUT I dont want this.... instead of this Pivot table shows the actual percentages in % of column.. Any Idea ??? In the two pivots in the attached workbooks, how did you turn off the "Column Labels" and "Row Labels" dropdowns? Hi, Chandoo I think pivot table are useful to make a report one time, but if you really want a "monthly and dynamic" reports I would like to use another technics, formulas to extract dates and data. I don't know what I am doing wrong but I'm getting #N/A instead of a %. I have tried several times completely from the beginning, and have (well thought I have) followed the instructions carefully. Hi Sally... Does your data have any blanks or missing months? Solved it thank you - when I used your figures, I realised the "month" I am to select is actually the first column (the date) rather than the values. Looks wonderful now - will certainly add dimension to my sales reports. Thank you Chandoo for sharing your knowledge so freely. Back again ... I'm just so excited about what I can now do so easily. I've read your comment about using it for running totals and have added that into my table as well - something I was doing manually up until now. Iam very much confused with the example..can some one share some easy way to do the same example. Report Filter has Month to select. Column E i want % Variance of Target minus sale of Divi A.
I have tried various option of Column total % i am not getting the proper variance. I will greatful if you help me. Been following your website for a while and i think you are doing a pretty neat job and your Excel skills are quite superb. I do have a question about what if i need 2 sets of Arrow ICON SETS for a similiar report i am working on. Within the Conditional Formatting comman, the built-in XL2007 Arrow Icon set is fine where (Favourable) increase is Green UP arrow while (UnFavourable) decrease is Red DOWN arrow. This suits my one need. However, the other need is Opposite in rationale (such as showing for expense comparison). In this case (UnFavourable) increase should be Red UP arrow, while (Favourable) decrease should Green DOWN arrow. The icon set in XL2007 only has the Red DOWN pointing arrow and Green UP pointing arrow and not the other way round. Opting for "Reverse Icon Order" only changes the order but not the up/down orientation of the arrows. Any suggestions as to how can this be achieved would be appreciated. Hi Chandoo, a very neat & useful article, however, the last point is not much clear.i.e. "We can go one more step and show just icons", how to do it? Thanks Chandoo. I really want to use this but the problem is I can no longer sort by values which I need to be able to do when. Do you know what the solution might be? Very helpful. I've got a quick question - what If I also want a column showing the Year over Year % difference by Month? For example April 2013 as a % of April 2012? Thank you very much Chandoo. But how I can handle conditional formatting in a pivot table when I have errors in the calculation of % change? It seems that Excel is not applying conditional formatting when I have an error in the column. I use this technique often (showing a sum and % in the value field). When I make a pivot chart from this table it graphs both the sum and the % - how can I get it to graph only the sum? I am basic in Ms excel. 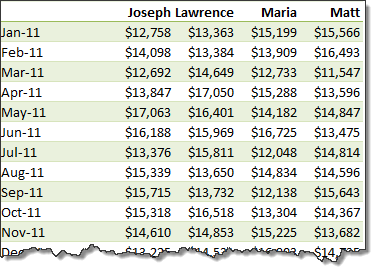 Can I use a pivot table for a month to month comparison? To date our Jan-Jun sales totals 1.1 million. I need to know what is needed to reach 1.8m 2.0m; and 2.2 m for the rest of the year. Thanks Chadoo. I tried doing conditional formatting as you advised. It did not work. Could you please advice what could be the issue..
Great Stuff! What is your recommendation for using icon sets with % change from previous month when a negative number grows to a larger negative number? The formatting shows this as positive, resulting in an up arrow or positive change when in fact it should be showing a down arrow or negative change. Mathematically the negative over a negative cancels out. Any insight on this would be very helpful. Keep up the great work! Hi, need some help please. Want to use a formula with reverse calculations, and I am mathematically dyslexic. Lets say i have 25 days in my month, and by day 25 i need X amount to cover costs etc. What formula can i use that will tell me what daily amount i need to reach this. But, this figure should take into account the amount I made the day before. Please help? I'm working with cumulative data and using Difference from... Previous month to convert it to monthly data. In the first month of activity for a program, monthly data should match cumulative data, but shows up as zero or empty instead, rendering monthly data unreliable. Any suggestions on how to get Excel Pivot Table to calculate Difference from... Previous month differently for cases where there is no data for the previous month? I found a solution/workaround. By entering a record for each program at time zero (in the source data) with no cumulative data, the calculation is corrected. This provides a previous record for the Pivot Table to calculate differences from. Thank you for these step by step instructions. They are fabulously clear and simple. This is balamurugan and i know the only the basics of the Excel and now I want to make the report for our product in for the monthly material consumption it should be came monthly vise and the output also we will mention, so that we can compare what is the consumption of the particular month and the output efficiency, we have to make the chart also. Thanks. It's very usefull. Works well. I often use this technique to compare data from 2 different lists (for example, the inventory detail vs the accounting entries) and spot the differences. Very nice. But what when I have January to be expandable/grouped into its weeks? Any chance the Change is also shown for the weeks when expanded? Like Week1 2017 vs Week1 2016? never mind - made a mistake. In case the report views from differences by row. So how can I do the change rate like that?